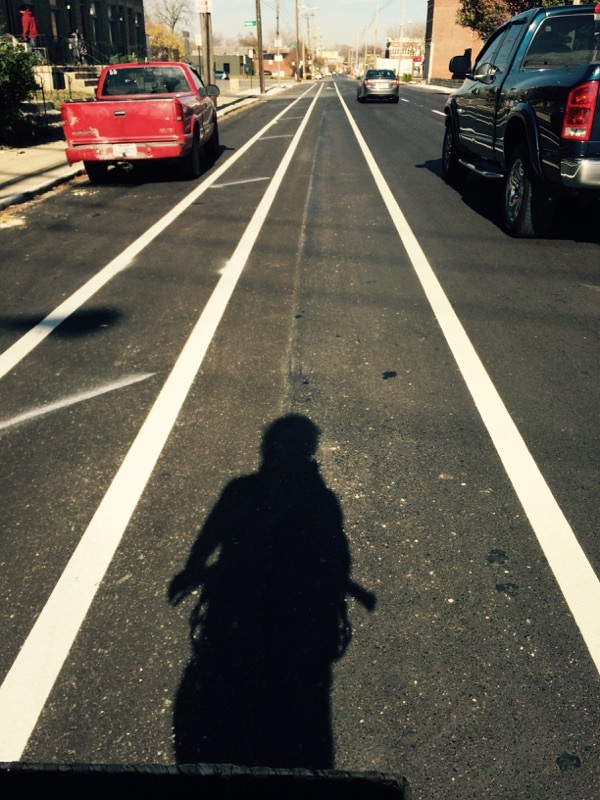 No better way to update my blog then with the current design changes on some of our city streets, and my thoughts and experience as I biked them. 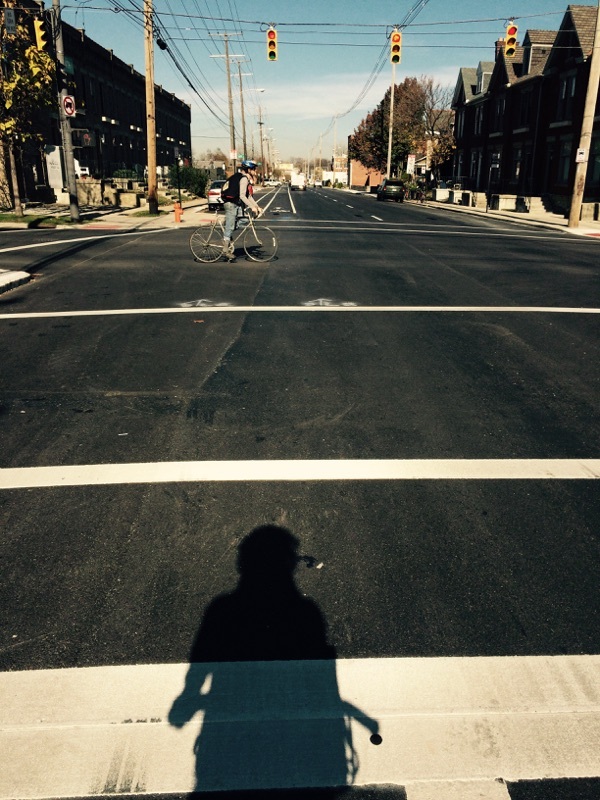 Many of us who ride bikes have been patiently waiting for street redesign on both N. 4th Street and Summit St. These streets are both one way, five lane streets: double-sided parking with three travel lanes. Needless to say, these streets have disconnected people in their neighborhoods with cars speeding through them at an easy 40 mph. These wide streets yield in long crossing distances for pedestrians leaving them with the feeling of being rushed if the crosswalk timings are short. 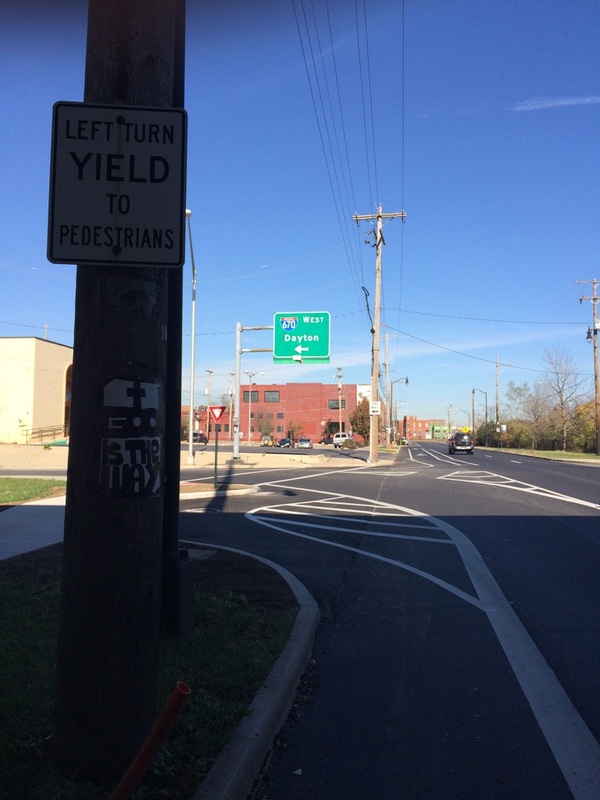 If you’re not familiar by now, the city of Columbus has been engaging the public and gathering public comment – coming up with a true Multimodal Thoroughfare Plan. This initiative referred to as ‘Connect Columbus’ aims to improve safety, reduce congestion, assist children and the elderly, and promote economic development, fitness and environmental responsibility. The Multimodal Thoroughfare Plan will define the future of transportation in Columbus by providing the rules for alternative means of travel. A community that is more pedestrian, bicycle and transit friendly is a more livable community. More info can be found here: Connect Columbus. This plan coincides with COTA’s ‘NEXT GEN‘ Plan and MORPC’s, ‘Metropolitan Transportation Plan.’ All thee of these comprehensive plans are working towards the region’s overall future transportation systems. I believe that our city is finally realizing that solely prioritizing cars is not what everyone wants , does not contribute to an improved quality of life, and, frankly….isn’t working. 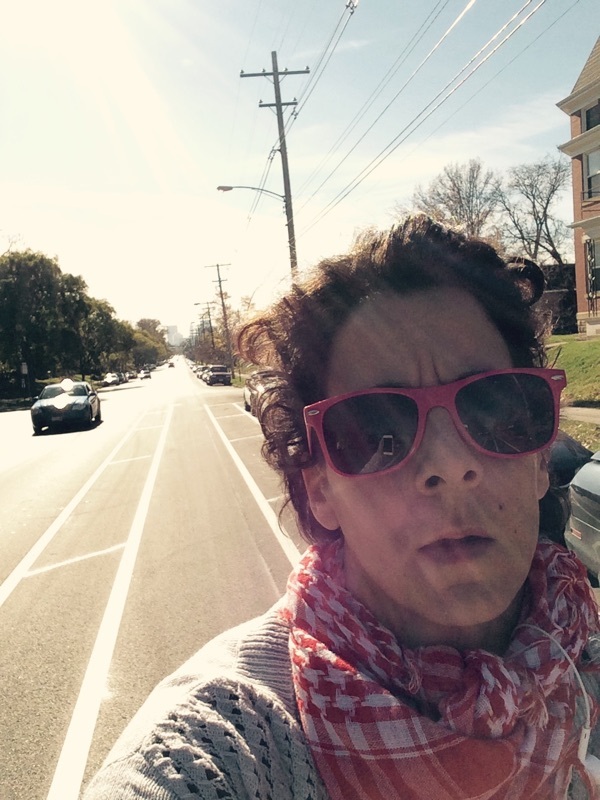 With that, I’ll share my recent experience of biking N.4th St. and Summit St. during lunch. 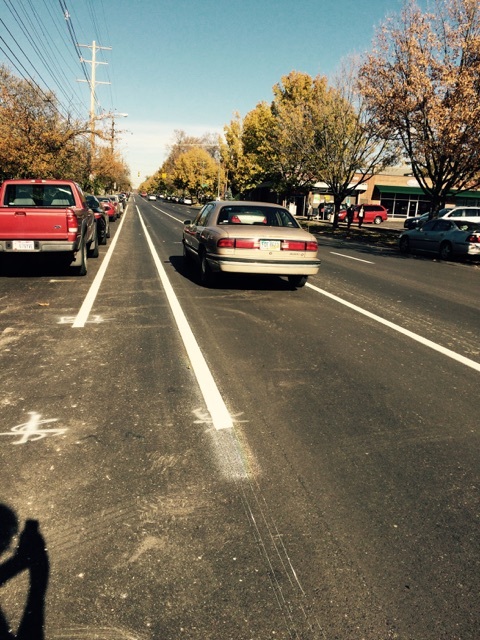 I’ll begin with saying that the new re-striping of bike infrastructure on N 4th. is a vast improvement of the death trap that was painted before. I took a lot of photos so I can describe as best (and clear) as I can, the changes, what I experienced, my questions/concerns. I’ll also preface stating that I know both of these streets aren’t fully finished yet, so keep that in mind as well. This is just north of the 670 bridge. There was quite a bit of gravel in the bike lane. If you remember prior to this redesign, we had no buffer AND the old bike lane shifted us right as drivers were accelerating downhill and racing to get to the 670 entrance ramp. This is probably close to a 2ft buffer between myself and the car travel lane. We now ride all the way under the bridge. 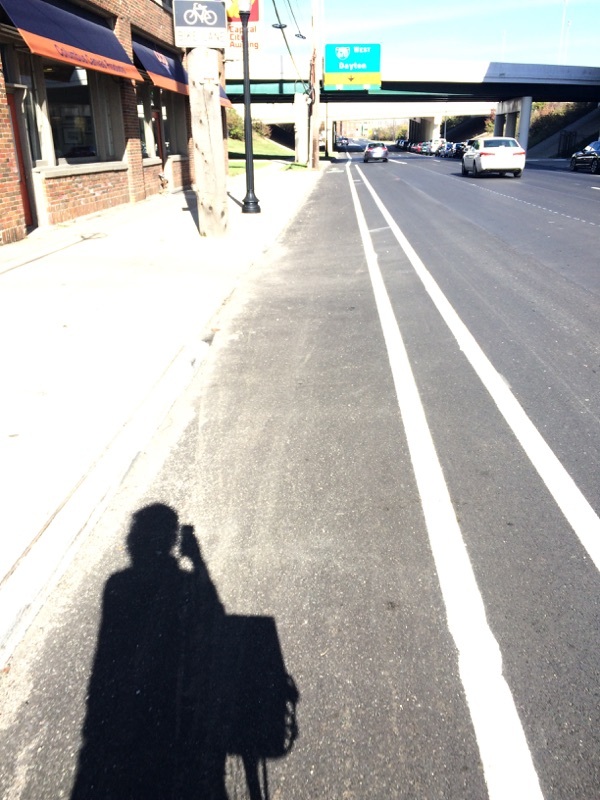 The buffer drops off b/c here’s where the ‘dance’ between drivers and bike riders takes place. As you know, drivers should be yielding to people riding bikes b/c they are the turning vehicle and we are the ones traveling through. The bike lane jogs left to where you can slow and have a bit of time to look over your shoulder and confirm you can continue riding north. If you can see, there’s now a pedestrian crossing. In the upper left corner of the pic, the signage says ‘yield to pedestrians.’ I’ve emailed the lead project manager twice now asking if this can say, ‘yield to bikes and pedestrians.’ Again, as we are considered the ‘through’ travel lane, we have the right of way and drivers should be yielding to us prior to making their left and merging onto 670W. I feel that adding ‘bikes’ will make it clear and reduce any confusion as to who has the right of way. 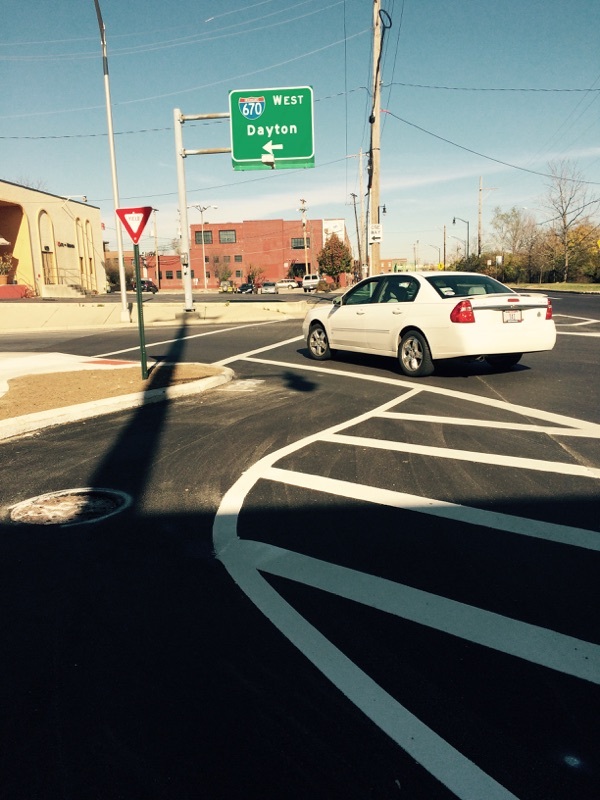 A better view of a car entering 670 and the crosswalk. I am definitely a lot happier about this jog to where we are set back just enough to have a couple of seconds to look over our shoulder to make sure we’re clear to continue north on this street. This stretch is still intimidating and tricky; cars drive just as fast as they did before the redesign and you have the entrance ramp to 670 on one side and cars exiting off the freeway onto 4th on the other side. 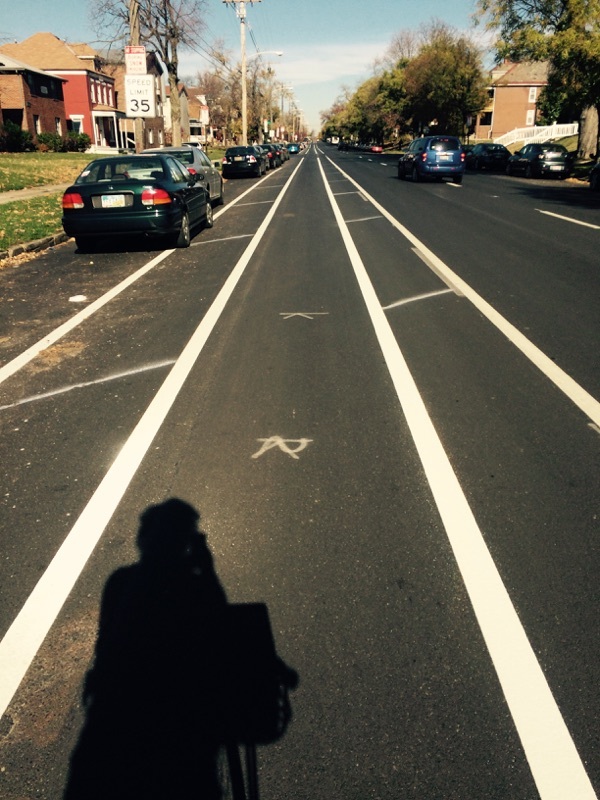 Once you’re past that area, there’s a dedicated bike lane. The buffer ending and another shot of how much further way a car is with the buffer than without. It definitely helps, stress-wise. 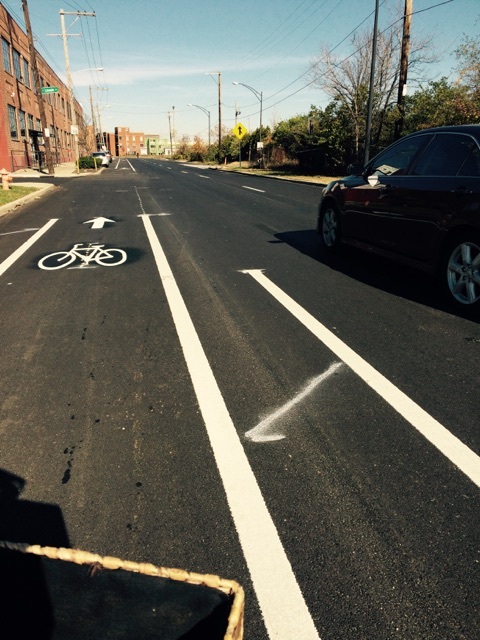 As previously stated, the buffer between the bike lane and the travel lane drops off. The buffer has now been switched to the left side of the bike lane by the parked cars which I’m not a huge fan of in this instance and here’s why: think about how often you drive by yourself. Over 85% of drivers drive alone. So, if the majority of the time you’re driving alone, you’re parking and exiting your car on the drivers side. The percentage of being ‘door’d’ on the passenger side of a parked car is very low due to high Single Occupancy Vehicles (SOVs), therefore, the city should have kept the painted buffer on the travel-side of the bike lane again reinforcing a greater sense of ease. 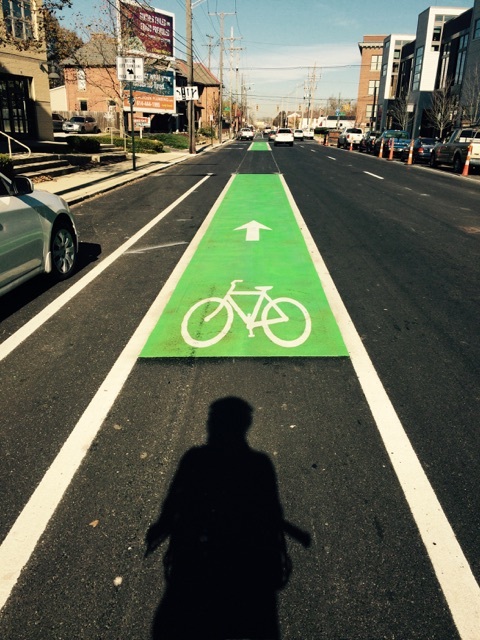 We’re finally using green paint which I’m a fan of b/c of the visibility factor, plus, it reinforces that people riding bikes belong in the road, too. The paint is just before/after intersections catching the eyes of drivers to make them aware and cautious that they could see riders. Let’s hope this helps reduce any turning conflicts. Another rider heading east on 2nd as I’m waiting for the light. The car traveling next to me on the right, if that painted buffer was swapped to that side, I’d feel less stressed about the moving vehicles to my right. A moving truck turning left, apparently didn’t see the big left turning lane. This is at the corner of N. 4th and 5th Ave. Crossing over 5th Ave here’s a reverse shot of where the cars are in proximity to me without the painted buffer. Then, on 8th (?) there are now double painted buffers on BOTH sides. This made me feel a lot better – having the extra padding on the travel side. That’s a FEDEX truck to my right. A lot less intimidating with a 3.5 ft buffer between you and a big vehicle. Another reverse shot to show the padding with the painted buffer. Go back up to the other reverse shot and look at the difference in car placements with having/not having a painted buffer. Even paint can make a lot of difference. Then, at around 17th, it gets confusing and it’s probably because it isn’t finished. I actually wasn’t sure where to ride but I’m assuming (after measuring these two areas) that the city will be sticking with the double-sided buffer like the three previous images. A car driving in what I do believe is the bike lane. Another shot as I continue north on 4th. 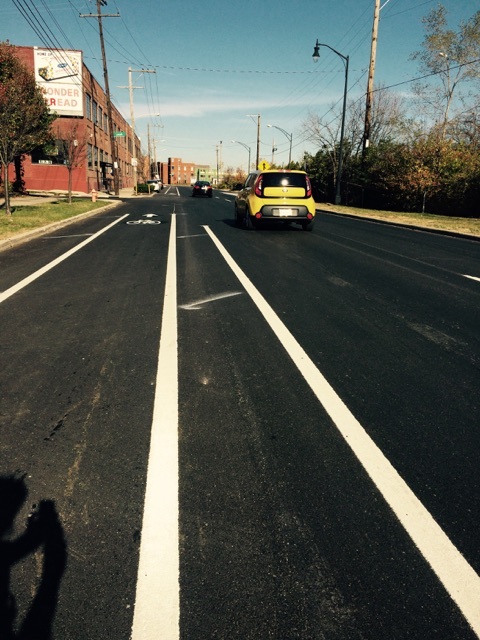 The re-striping goes all the way to Hudson Ave. Overall, I’m pretty happy. I mean, in Jessie’s ideal world, a street like this should have protected bike lanes. There’s no reason that it shouldn’t. 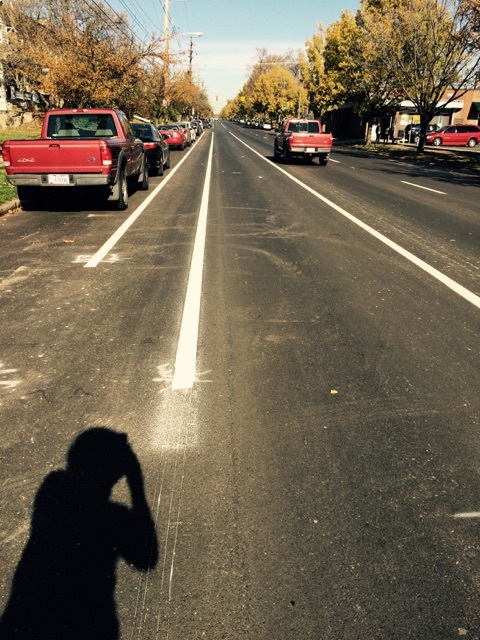 We didn’t have anything on this very fast street and for now, we’ll at least have a double-sided, buffered bike lane. 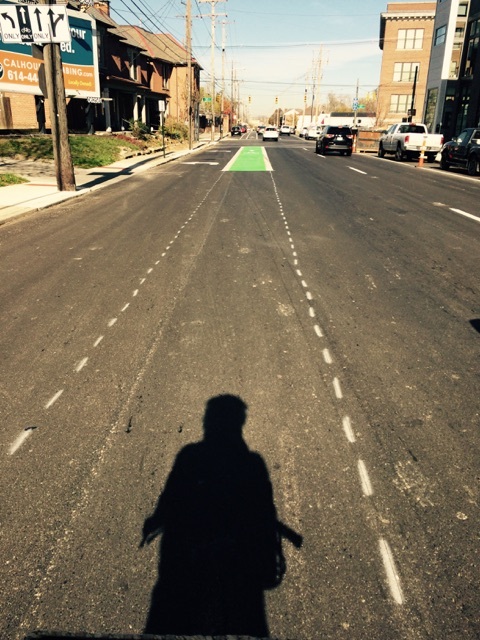 I do hope more green paint will be laid down before/after intersections. I hope the ‘yield to pedestrians’ sign gets changed to say ‘yield to bikes and pedestrians.’ I’d love for the posted speed limit to be reduced. Will we see more people riding 4th now? I think there may be a small uptick in certain areas but will it be anything drastic? No. A street like this is so dominated by cars that unless it gets a protected bike lane – no huge increase will happen, IMO. I hope the success of the Summit St. protected bike lane will give the city the confidence to create separation in the future on 4th St. and many others. 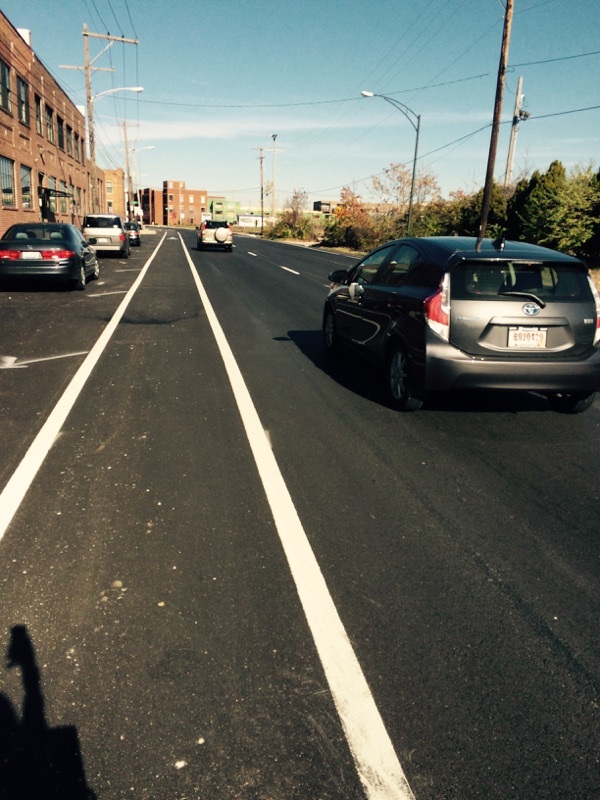 Now, for my favorite part of this post – riding Columbus’ FIRST protected bike lane. Many of you know that I have been vocal for years wanting this kind of separation. 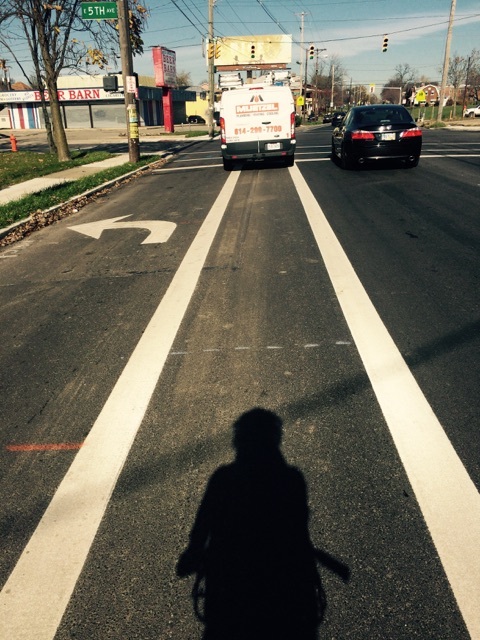 I can tell you right now that just as I was entering the protected bike lane on Summit, a smile immediately appeared. 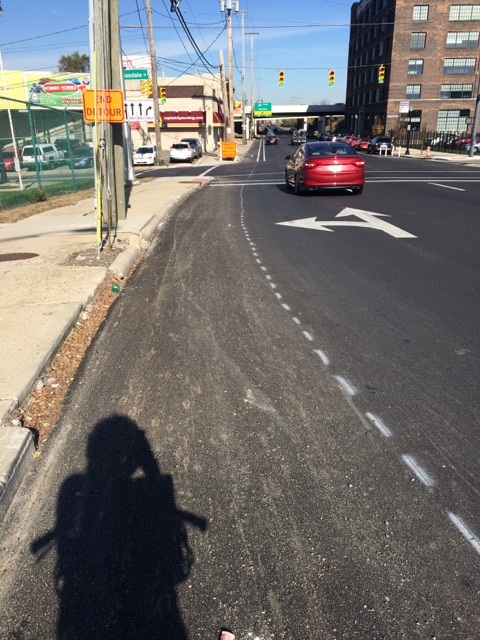 The protected bike lane begins at the corner of Summit & Hudson and stretches all the way to 11th Ave. 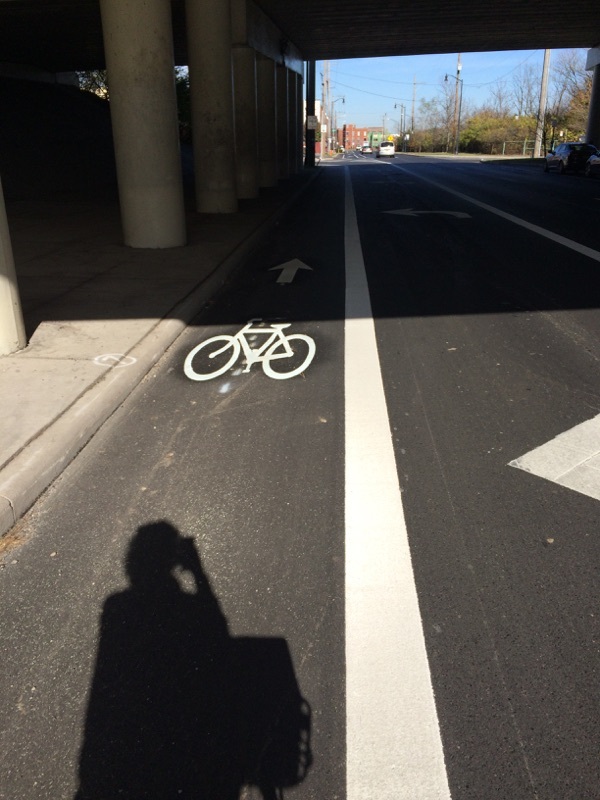 It is a two-way protected bike lane meaning you can bike the protected bike lane in both directions which you’ll see. Obviously, it’s still under construction but, people are already riding it. 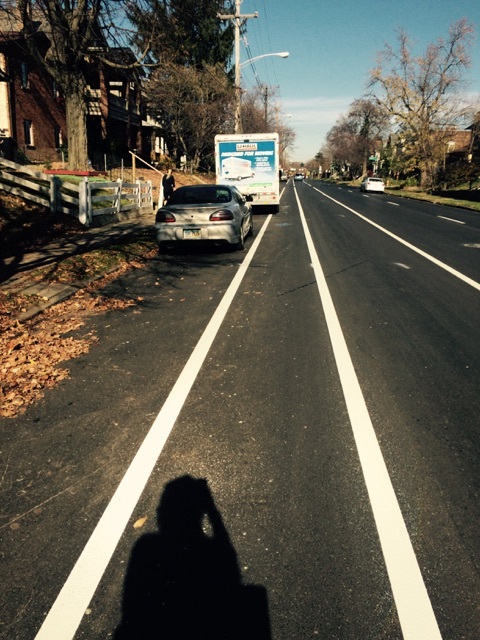 Protected bike lane on the right and turning vehicle ‘yield to bikes’ signage all down Summit. These barriers are placed after each intersection to prevent vehicles from turning into the protected bike lane. Gotta get the drivers use to this. 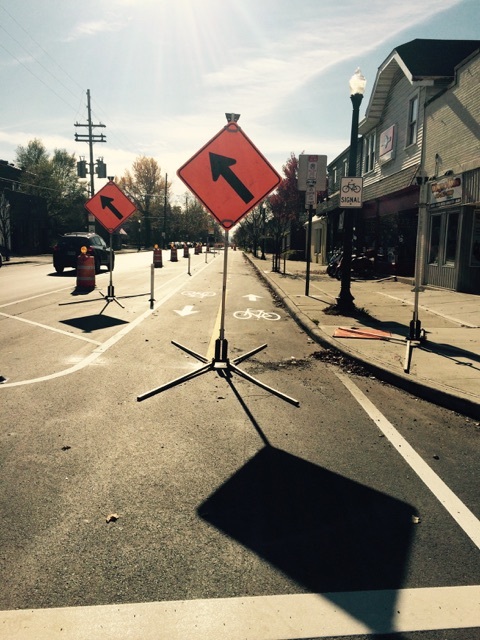 Protected bike lane, flex poles and there will be parking available. Another shot of the pedestrian refuge. Shortens the distance to a pedestrian needing to cross. Nicely done. This street, once a five lane inner-city freeway is now being transformed into a more ‘humanized’ street. The painted buffer is about 2ft wide. I can’t reiterate to you enough how stress-free riding in this feels. Wait, yes I can. This is how separated infrastructure makes me feel. I’m not concerned with speeding cars behind me or parked cars to the side of me. This type of infrastructure provides a person a TRUE freedom of choice in how to get from A to B. When you have the ability to remove fear and intimidation out of your choice in how you move around the city, it makes choosing to ride a bike a hell of a lot easier. Another shot of the protected bike lane and pedestrian refuges. I’m able to stop if I want b/c I’m separated from moving traffic. These will become parking spots when finished adding in another added ‘buffer’ for both the people riding bikes and pedestrians on the sidewalk. Another shot of how happy I am and seeing this finally become reality in my city. A whole new perception and perspective when you have complete separation. It was lunch time but as you can see there were a bunch of cars and look, the city didn’t collapse when you remove a travel lane and add in bicycle infrastructure that’s going to improve people’s bike riding experience. You’ll be able to ride both north AND south. Sadly, as you see above, the protected lane does eventually end then goes back to what I believe will be double-sided buffer once its finished. I hope the double-sided buffer extends over the 670 bridge into downtown as Summit turns into 3rd. Riding your bike over this bridge is absolutely DREADFUL! Another thing that has always bothered me is that there are two posted speed limits about 100 yards apart from one another. One states: 35mph and 100 yards down, 45mph. What gives? My overall experience on both streets was pleasant. 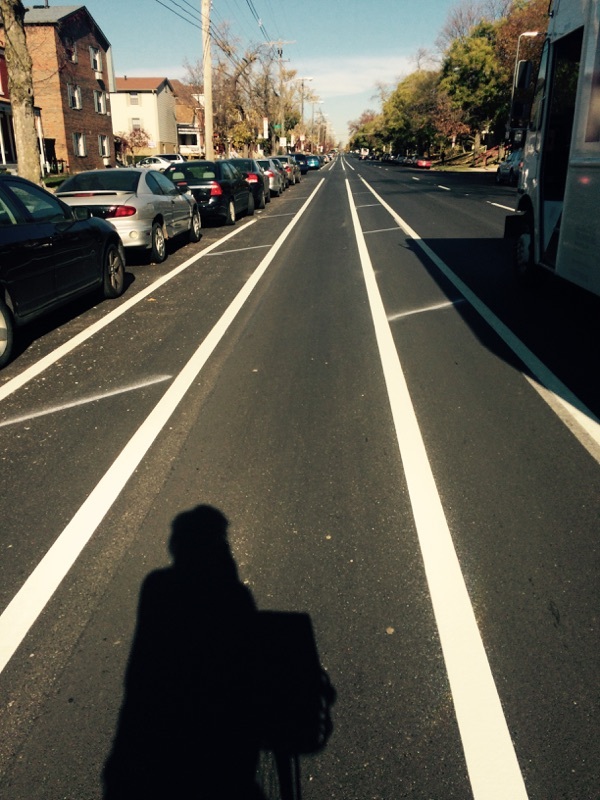 Of course, the protected bike lane takes the cake, hands down. 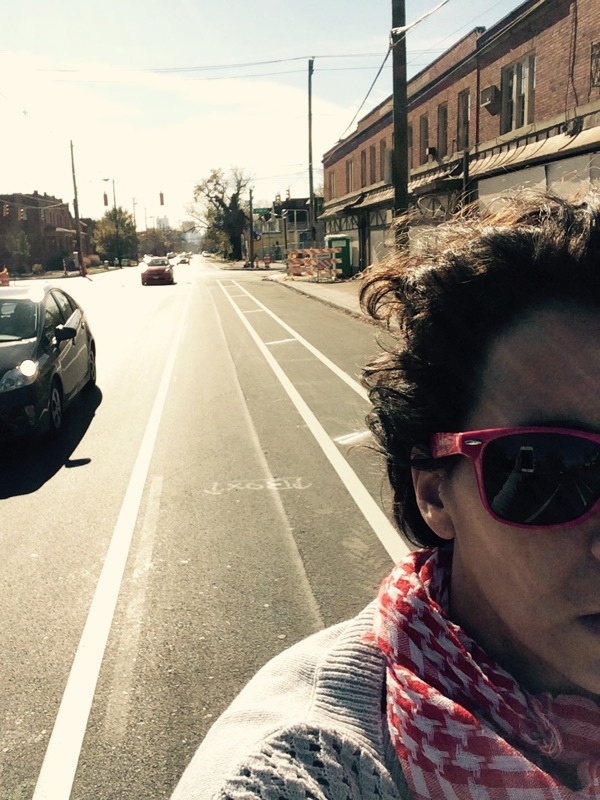 Anybody reading this, I can’t stress enough how important it is for you to ride the protected bike lane; take your friends, your family, your significant other and ride the bike lane and post, tweet, share how much you are in favor of separated infrastructure so the city builds more.